I've seen a bit of a 'net-kerfuffle between a couple other publishers' Obama-centric comic covers and one claiming they had the idea first and all that. I stay out of such things, especially when they're both wrong. 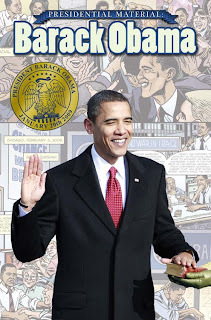 We were not only first, we're now going back to press for the fourth time on our PRESIDENTIAL MATERIALS: BARACK OBAMA comic (for some reason, the John McCain comic hasn't sold quite as well...). The fourth printing will have an all-new cover on it along with a transcript of yesterday's acceptance speech. And not one appearance by the Chameleon on this one--sorry, Cham fans. *Sorry, my head just exploded while I tried to follow this whole snake-eating-its-own-tail thing. Where is this net-kerfuffle taking place? By the way, I can't find "kerfuffle" in the dictionary, but I'll check a few others. Wait... it's in the "Urban Dictionary". you should make this comic an on-going!! I think that argument isn't over who made a comic about Obama first, it's over who capitalized on him to sell an existing comic first. Which is an even dumber argument. Charlie, I make up things every day, like when I say "I'll get RIGHT BACK to you." "Charlie, I make up things every day, like when I say 'I'll get RIGHT BACK to you.'"